A reminder of work we did using brand equity to represent assistants on the Web. We assumed that a well known ad character would an ideal way to engage, with an otherwise chatbot-style interaction. This could have been good input to the project. Much more at the links below. Be glad to chat. University of Washington in Seattle researchers conducted a study of robot faces--157 in all--across 76 dimensions, to determine the distinct ways people experience them. Among the study's insights was that robots whose faces were rated less-friendly lacked a mouth and pupils, but had eyelids; eyebrows also were deemed to be indicators of intelligence. 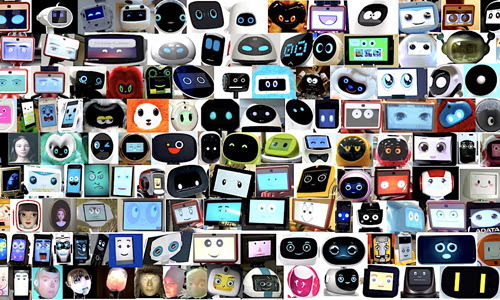 Although no robot faces were rated as significantly more likable than the baseline face, the robot that possessed irises was the most liked by survey participants overall. "I think our work helps to elucidate what kind of effect certain design choices have, and while these results are by no means definitive, I think they do help prime our thinking about design consequences," says the University of Washington's Alisa Kalegina. The work was presented in March at the ACM/IEEE International Conference on Human Robot Interaction (HRI 2018) in Chicago, IL. ... "